A 5.7-inch display phone with facial recognition feature, a 13 MP rear camera and an 8 MP selfie snapper and coupled with 2GB+16GB, 3GB+32GB or 4GB+64GB RAM and storage. The lowest price of OPPO A83 is P6,599 at Taiyen General Merchandise, Ame Czarrief Cellphone Shop, Shanylle General Merchandise, Tere Cellphone & Accessories, Amisha-Fae Gadgets & Accessories, BOSH ANTHON TRADING and Shopee, which is 45% less than the cost of A83 at Shanylle General Merchandise, Amisha-Fae Gadgets & Accessories and BOSH ANTHON TRADING (P12,000). This smartphone is available in 16GB, 32GB, 64GB storage variants. The latest price of OPPO A83 was updated on Apr 19, 2019, 10:21. OPPO Electronics Corporation which is called as OPPO is a Chinese mobile communication company, known for its smartphones and other electronic devices. OPPO was the top smartphone brand in China in 2016 and was ranked No. 4 worldwide. There are many reasons why OPPO A83 became so popular in the Philippines The OPPO A83 is priced at Php9,990 and customers can avail it via Home Credit with a 6-month installment with 0% rate even without a credit card. Aside from its promos and discounts, OPPO never failed Filipino user with its new affordable handsets and pact with great features and designs. The device packs a more than enough offerings and is placed in the middle of the entry and sub-midrange segment in the market. The OPPO A83 features a phablet size 5.7-inch display with a resolution of 1440 x 720 pixels which guarantees more than enough viewing pleasure when watching videos or just scrolling down on any social media platform. Given its pricing, the A83 doesn't come with powerful performance, although it can simply multi task any job you can throw at it thanks to its MediaTek Helio P23 SoC accompanied by 2Gb/3GB/4GB RAM configurations. Storage wise, a 16GB model, 32GB model and a 64GB model are offered, if it seems not enough, there's nothing to worry at all since the A83 comes with expandable storage support of up to 256GB via microSD card. OPPO phones are mainly known for its selfie feature. But the A83 don't seem to be at par with OPPO's other selfie-centric phone lineups. None the less, the A83 offers a 13MP camera with f/2.2 aperture and LED flash at the back and a 8MP shooter at the front with the same aperture of f/2.2 as well. Providing juice to the A83 is a mediocre 3180mAh battery which is sufficient enough given the category of it processor and other settings. Its pretty hard to challenge the OPPO A83's offerings overall given its price range, you get all the enough specification, camera quality, performance and not to mention the modern design of a Full Screen display. It even arrived with Android 7.1.1 Nougat based ColorOS 3.2 at the time of its release which was pretty a good deal. 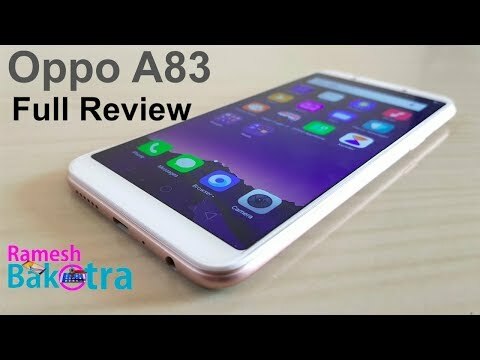 SHOULD YOU BUY THE OPPO A83 OR NOT? It's a pretty tough question, but budget wise, then you can't go wrong with the OPPO A83. Yes, it's not the fastest nor does it have the greatest camera on the market. But on this price range, it's hard to find another model with such offering. The best contenders around to match the OPPO A83's offering are Cherry mobile, HUAWEI and Vivo. If you want to check out other options available under the same price range, same full screen display, RAM and storage configurations, battery capacity, camera quality and latest software update, then those 3 makers might have something in store just for you. Aabot po kaya ng january ung anniversary sale ng Oppo units? Thanks po sa sasagot. Maganda ba sya pang games like ML, Ros, PUBG? at maganda ba yung battery life nya? Hello. Im an IOS user, planning to buy Android since sa android naman ako nagsimula. 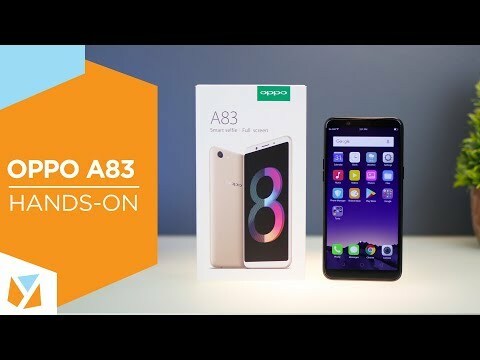 Mas okay ba ang Oppo A83 compare sa IP6? Thanks.